Leaving the small religious building at Mamean you climb first to Binn Chaonaigh. A hard enough ascent, but when you reach the top you can savour the fact that you have completed 54% of the climbing. As you can see on the model, your route takes you across a rounded ridge towards pt 659. A simulated picture of the twisting ridge of the highest areas of the Maumturks. Ridge from Binn Chaonaigh to pt 659. Photo: 1998 Here is a picture of that ridge. It is littered with brilliant white quartzite fragments which makes it an extremely unusual sight. This path from Binn Chaonaigh leads invitingly towards pt 659 and Binn idir an dá Log (central, in mist). The lake on the left is Lough Inagh, with Benbaun and Knockpasheemore in the Twelve Bens behind it. While on the ridge, look right to one of the huge corries on this section. As an interesting digression, the early maps including the inch to a mile and the half inch to the mile showed the route on from Binn Chaonaigh passing through this corrie, with disastrous results for many people on the organised walks in 1975/ 1976 both held in mist. If you look at the fragment of the Sheet 10 half inch map, the red lines are 30m contours, showing where the corrie actually is, in contrast to what the map shows. Following the line suggested by the old map will take you at least 100m down a near cliff into the corrie. Have a look at the photo below to see where you would end up. There is another big corrie to the north east of the highest point of the ridge, Binn idir an Dá Log. This summit, like most on the Turks, is not particularly exciting, though the views from it can be good. 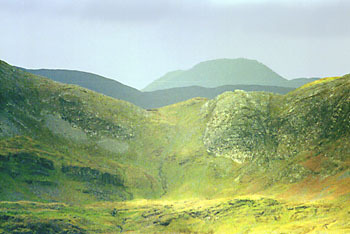 Corrie NE of Binn Chaoinaigh Photo 1998. View bearings from Binn idir an Dá Log You may be interested in printing out a table showing bearings to various mountains. The table has limitations, nevertheless it should help you identify any visible summits whether near or far. It is possible to avoid pt 659 (which appears as a spot height on the OS map) by contouring around on a path to the south west. Finding the summit of Binn idir ... can be difficult in mist, as it quite indistinct. It has a substantial cairn. On the organised walk there has usually been a check point on it. 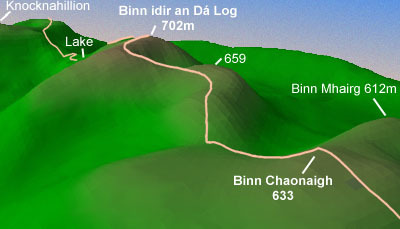 This map shows the tricky descent down to Lough Mhám Ochóige. (L. Nahillion on earlier maps) The route shown veers considerably to the left. Looking at the map, there might seem to be no point in this. However on the ground the ridge is extremely steep for most other routes. The route is from bottom right to top left. 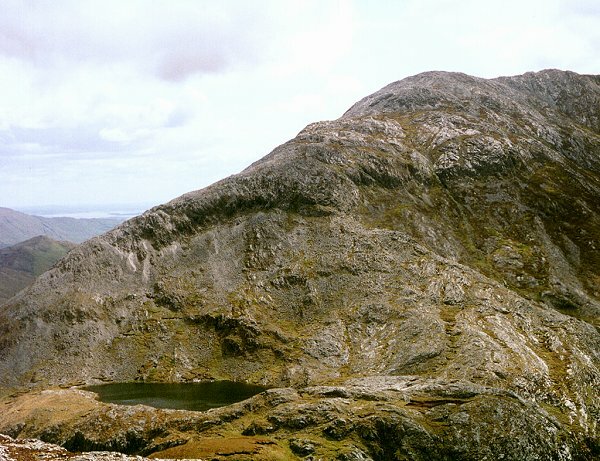 There are crags extending along much of the left, centre and right sides of the ridge. The steepness of the ground can be inferred from the OS 1:50,000 which includes 10m contours. 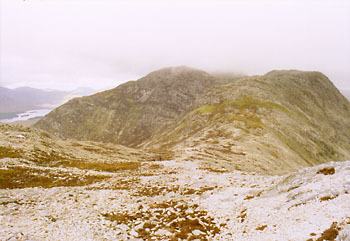 For further reference, view a picture of the dramatic ridge coming down to L. Mhám Ochóige that I took in 1996. The way recommended is only partly shown in this picture, being at the extreme right. Maumahoge col. (Photo: 1998. 200 mm telephoto taken from Lissoughter, a 400m hill to the south west of the main Turk ridge. Directly in line with the lowest point on the near Turks ridge is a col named Mam ná Li. Behind that again is the huge hulking shape of the Devil's Mother). Maumahoge marks the end of the second section of the walk. Descending to it is tricky because you can easily find yourself stuck halfway down a cliff. While there enjoy the lake and the rough quality of the land. At the lake you will have gone 51% of the distance and done 63% of the climbing. Sadly a local landowner has put a forest with obtrusive track on the NE side seriously detracting from the wild quality of this place which otherwise has no paths, objects of veneration or ruins. 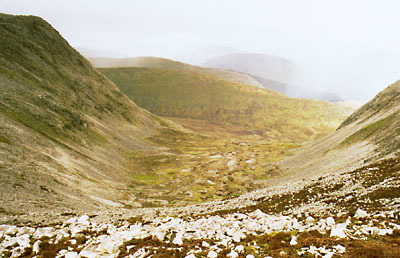 The steep rise to the left leads on to Knocknahillion and Letterbreckaun, which are covered in the next section.